The Calendar Address is the public address for your calendar. With this address, others can subscribe to your public calendar, view your events via feed readers, and view a read-only version of your calendar directly in their browser. Your calendar must be public in order for your friends to use your Calendar Address. To edit the amount of information available, click the Change sharing settings link. Your calendar must be public in order for others to use your Calendar Address. If you wish to keep your calendar private, it will only be accessible by those who have direct sharing privileges. You can change the amount of information available at your calendar's public address by clicking the Change sharing settings link in the Calendar Address section. In the calendar list on the left side of the page, click the down-arrow button next to the appropriate calendar, then select Calendar settings. In the Calendar Address section, click the XML or HTML button. A pop-up window with your calendar's public URL will appear. • combine many feeds into one, then sort, filter and translate it. 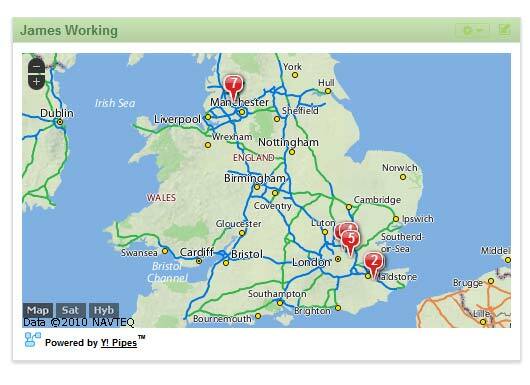 • Geocode your favourite feeds and browse the items on an interactive map. • Power widgets/badges on your web site. OK you have to have yahoo id (sorry) -you will need one. A must read is http://pipes.yahoo.com/pipes/docs but to be honest after playing with it for minutes, it was very easy to understand. 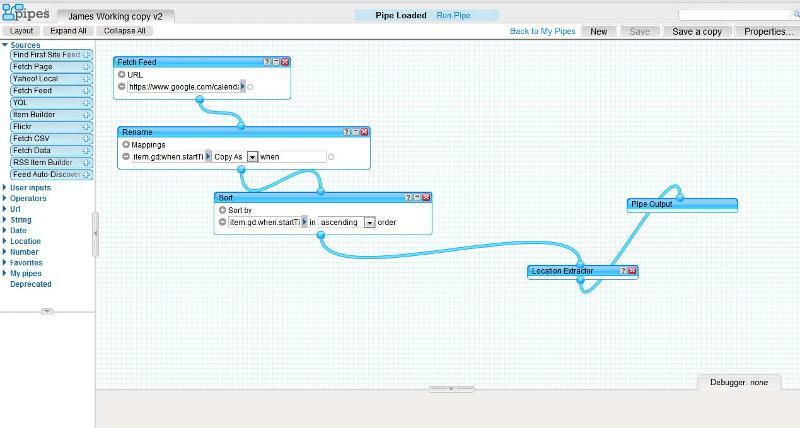 OK now to http://pipes.yahoo.com/pipes/pipe.info?_id=7773c39ab9e33b5cf96e468379130ea2 is my public version of a pipe. You could run mine: and you would see my calendar events: but ideally you would click either "Edit Source" or "Clone" - these make you a copy of my pipe. • you should then see you Google calendar events in maps. BUT WHAT ABOUT THE MAP? save html file. You can now publish this file to your web server and like magic your calendar appears when you open the page in your browser.